Holiday Season Card Using Snowman, Lg. “Snowman, Lg.” was stamped on white card stock and colored with pencils. The snowman image was torn out to create ragged edges which were accented with blue chalk. A green piece was torn to be a little larger than the torn snowman image and both were layered onto red glossy card stock that had been trimmed with decorative scissors. This was layered onto white card stock. Card by Margaret Wiggin. 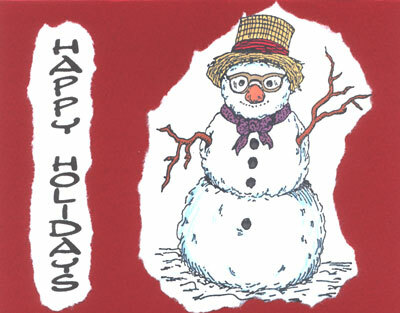 Holiday Card Using Snowman, Lg. “Snowman, Lg.” was stamped on white card stock and colored with markers. The vertical saying, “Happy Holidays” was created with the computer program, PrintMaster 15. 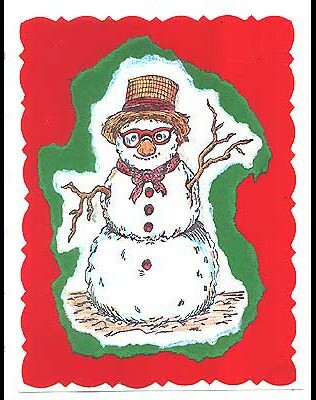 Both the snowman image and the saying were torn to create ragged edges. These two pieces were glued to a Cranberry card cut from half of an 8 1/2″ x 11″ piece of card stock folded in half. Card by Karen Krumbach. 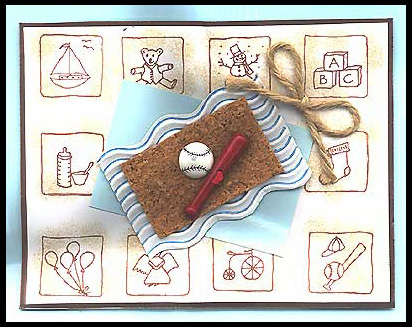 The following ten stamps were stamped on white glossy card stock in brown and the images were lightly sponged with brown: “Sail Boat”, “Teddy Bear”, “Snowman”, “Blocks”, “Baby Bottle”, “Socks”, “Balloons”, “Angel”, “Tricycle”, “Bat, Ball and Cap.” The card was edged with a brown marker and layered onto light blue glossy card stock. The embellishment was created by using a small rectangle of glossy blue card stock, corrugated white card stock marked with a blue metallic gel pin in the groves and cork which has a bat and a ball charm glued to it. A hemp bow was the final embellishment. Card by Thalia Sledge.